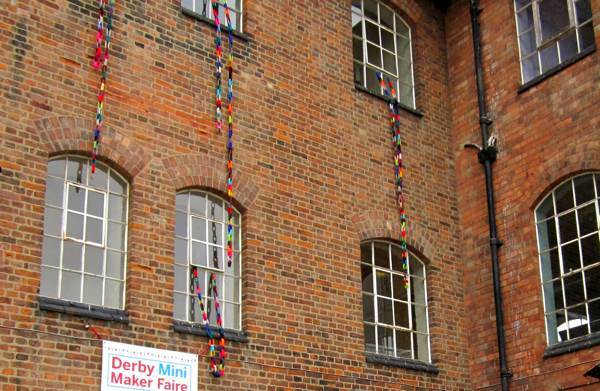 This past weekend Derby was lucky enough to host a Maker Faire in the historic Silk Mill Museum. Maker Faires started in America to celebrate arts, crafts, engineering, science projects, technology and the Do-it-Yourself mindset. 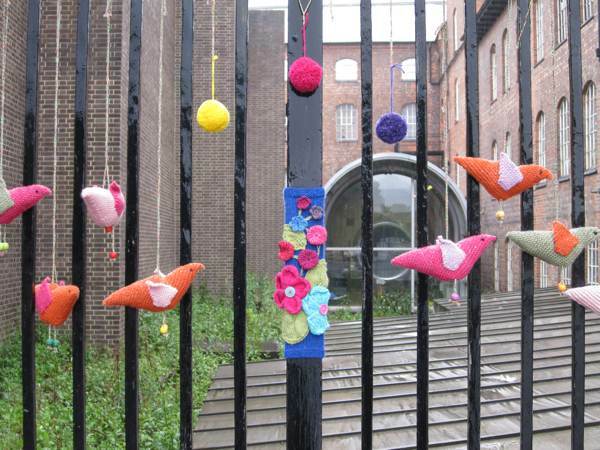 Derby is the third city in this country to host one and as part of the celebrations a small group of knitters and crafters (Anne and myself included) decided to Yarn Bomb some of the outside area of the Silk mill building! We began by deciding exactly how we would like to decorate the building. Two members simultaneously came up with the idea to knit ‘paper’ chains. The first photo is of one of the chains hanging in my garden and the second is of 7 chains hanging from the building itself. We also decorated some large ornate gates, railings and posts outside the mill. Unfortunately like much of the country the Faire suffered from heavy rain on the day and this can be clearly seen in the photographs. 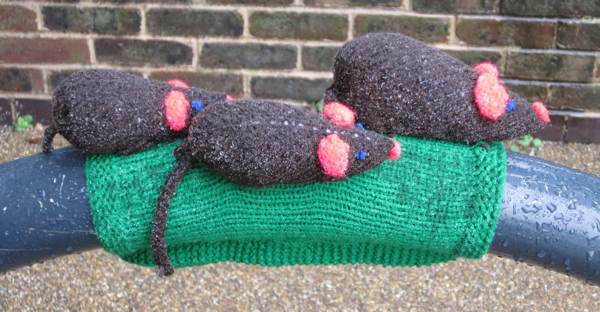 Thankfully Anne had thoughtfully sprayed all the knitting with a waterproofing spray so the creations survived, much to the delight of all. 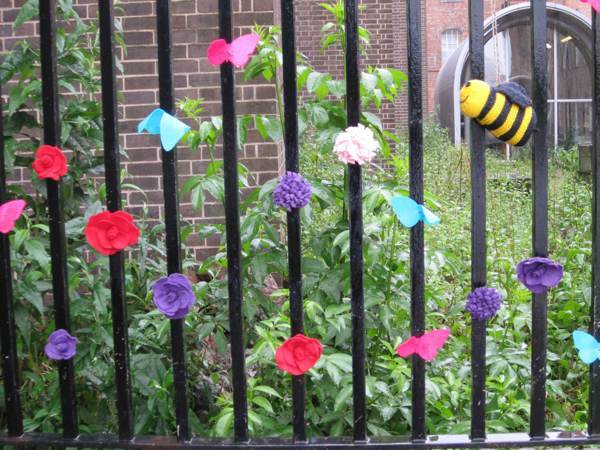 It was great fun creating and decorating with knits and felt and we now feel inspired to do more. 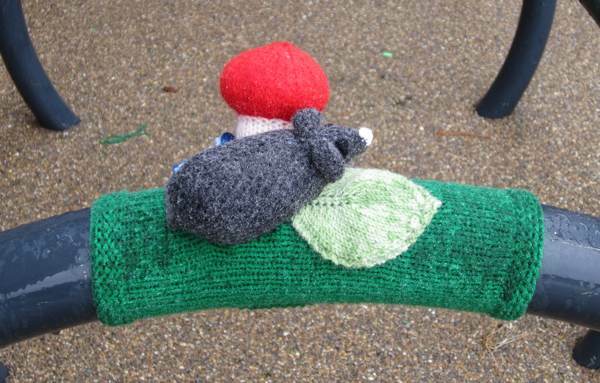 In fact this Saturday (9th June) just so happens to be International Yarn Bombing Day, so if you fancying getting in on the action and bringing a little creative joy to your neighbourhood now is most definitely the time! 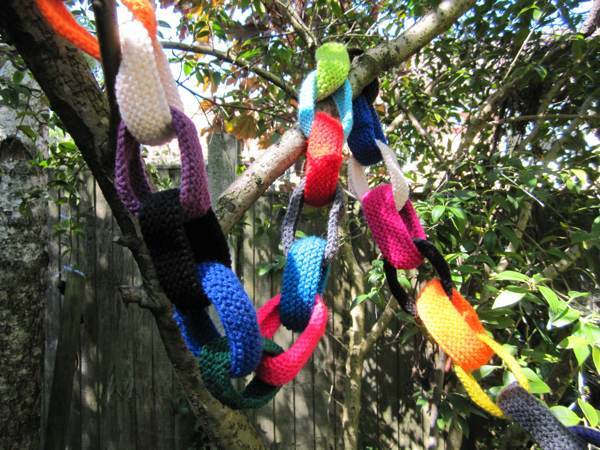 If you don’t feel comfortable yarn bombing a large structure then knitting a few decorations such as our chains can be a wonderful way to decorate your own garden and trees at home. Knit 10 rows all in Garter Stitch, then cast off. Then make them up as your would a paper chain, but instead of sticking the ends together, stitch them! 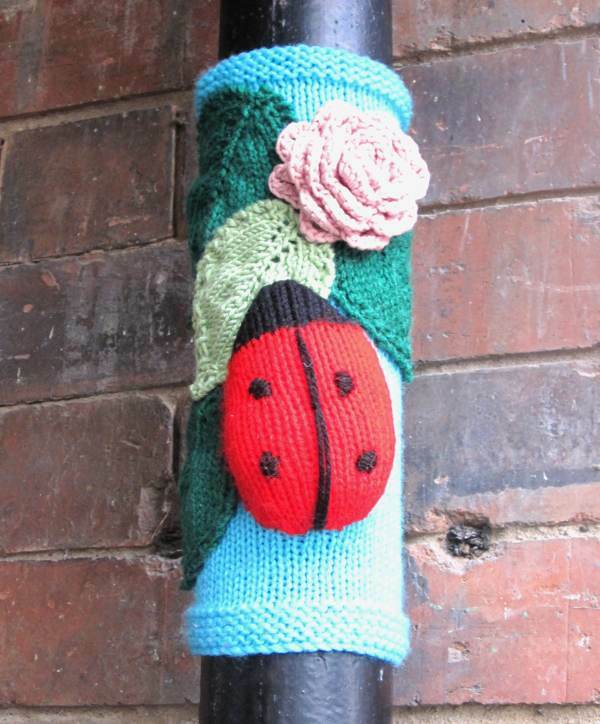 This entry was posted in Miscellaneous, Out and about, Tutorials and tagged derby, derby silk mill, international yarn bombing day, knit chains, knitted building decorations, knitted chains, knitted decorations, knitted paper chains, maker faire, mini maker faire, silk mill, tutorial, yarn bomb, yarn bombing. Bookmark the permalink. 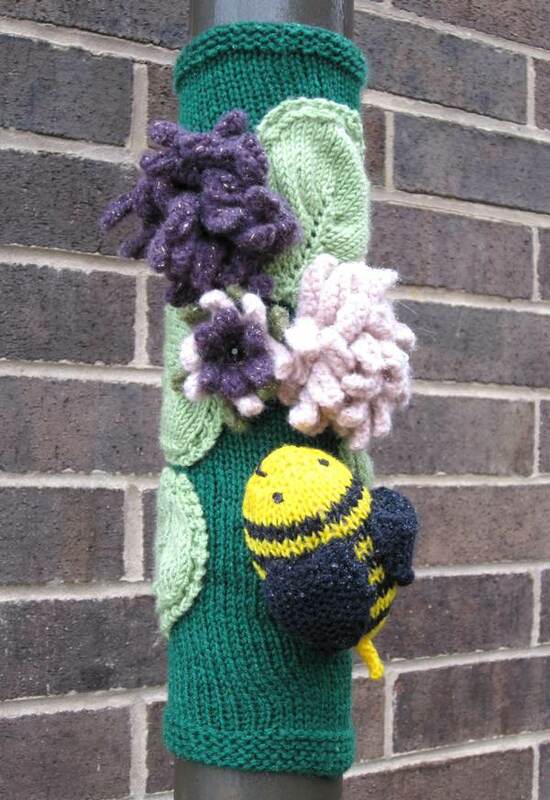 3 Responses to Yarn Bombing! It was a great weekend, wasn’t it? I’ve added a link to this blog entry to my posting on the Instructables website (we were near the door, next to the quadrocopter tent). Thanks for the link, it was a really good weekend.